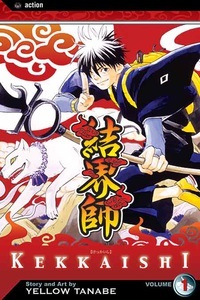 By night, junior high student Yoshimori Sumimura is a "kekkaishi" - a demon-hunter who specializes in creating magical barriers around his prey. By day, Yoshimori's got some other demons to battle: an addiction to sweets and a seriously crotchety grandfather! Yoshimori's pretty 16-year-old neighbor and childhood friend, Tokine Yukimura, is also a kekkaishi, but their families are feuding over who is the "true practitioner" of the art. Yoshimori couldn't care less about catching demons... until he realizes that his apathetic attitude is taking a toll on his friendship with Tokine. Just as he decides to take matters into his own hands, a couple of amphibious demons and the pesky ghost of a pastry-chef show up to complicate matters!